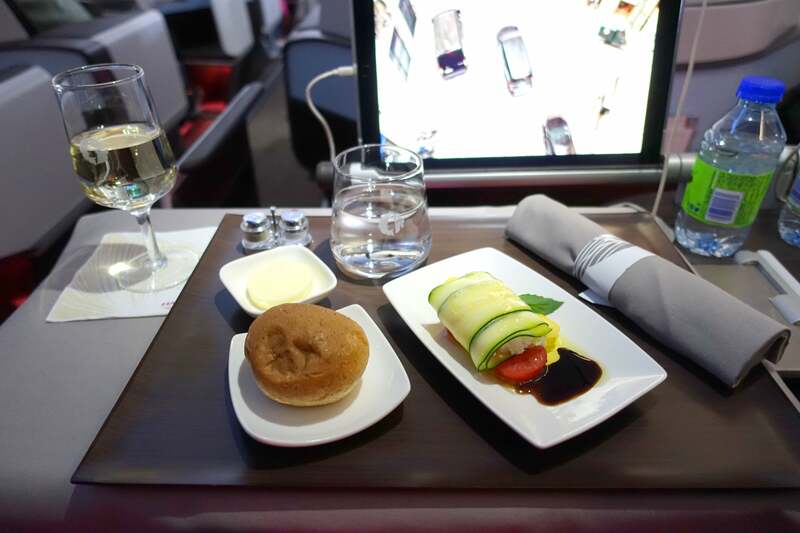 The airline’s new first-class product makes a great option for travel between New York and Hawaii. Pros: Comfortable lie-flat seats, great service and delicious food. Cons: No in-flight Wi-Fi and a clunky IFE setup. Hawaiian Airlines has been flying between its Honolulu (HNL) hub and New York’s JFK airport since 2012, and with flights between the two cities clocking in at about 11 hours, it’s unfortunate that the flag carrier of the Hawaiian Islands failed to have a more modern, lie-flat product up front, especially considering United offers lie-flat nonstop service from Newark (EWR) and typically from Washington, D.C. (IAD) and Delta offers lie-flat seats seasonally from JFK and other major hubs. 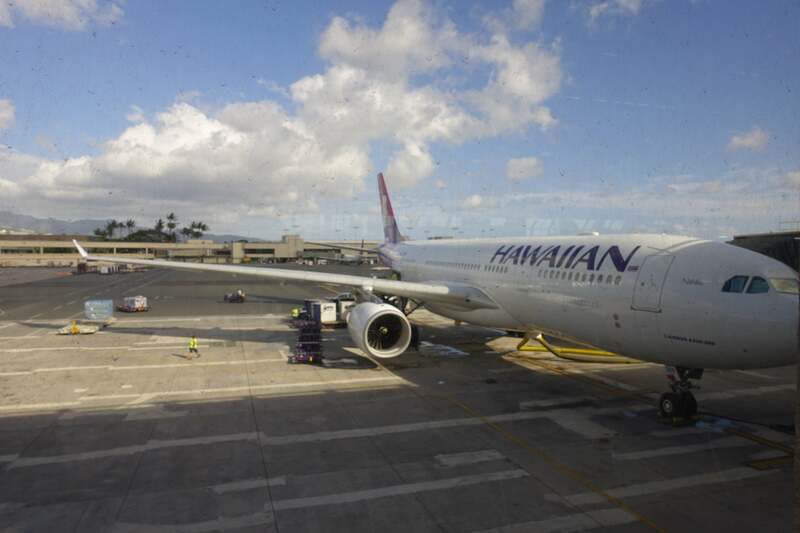 Thankfully, that’s all ancient history now that Hawaiian Airlines has given its Airbus A330s major upgrades to better establish itself as the best option for getting to Hawaii from the continental US. 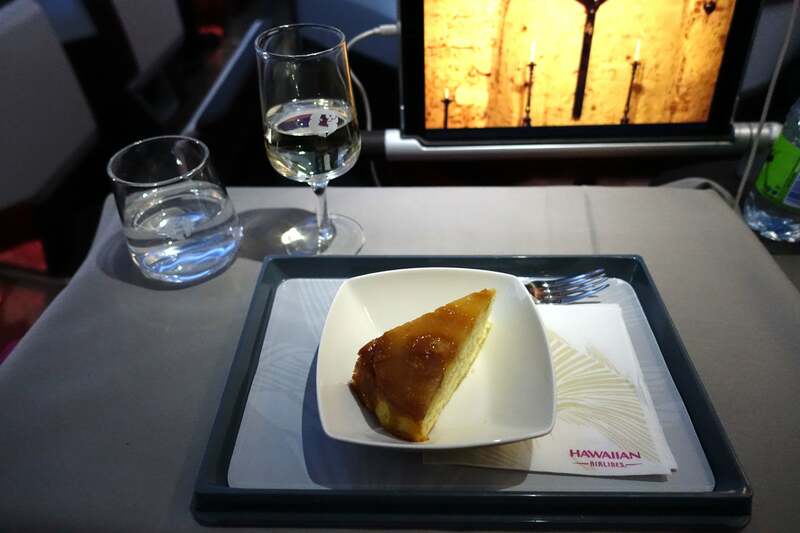 Several months ago, we got an an early look at the carrier’s retrofitted A330s, featuring its brand new, fully lie-flat First-Class product, which just began flying between HNL and JFK a few days ago. Yesterday, I had the chance to try it out for myself. 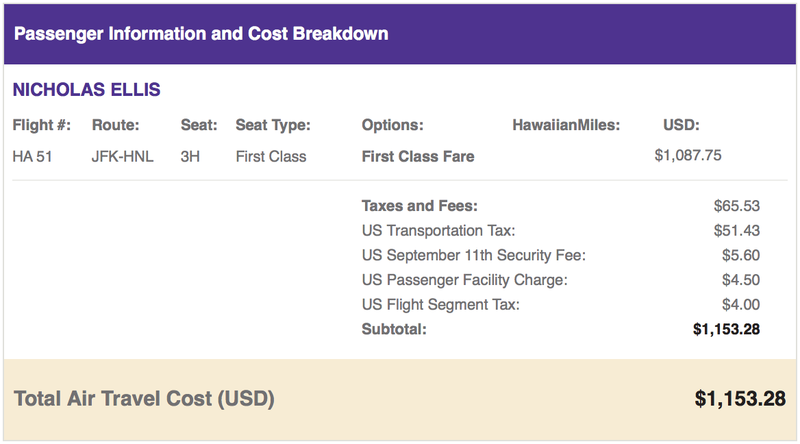 As soon as I learned that Hawaiian Airlines’ retrofitted A330s would be flying to JFK this month, I searched Google Flights and bought a one-way ticket to Honolulu for $1,153.28 using my Amex Platinum card — I ended up earning almost 5,800 Amex points since the card gives you a 5x bonus on airfare when tickets are booked directly with an airline or through Amex Travel. 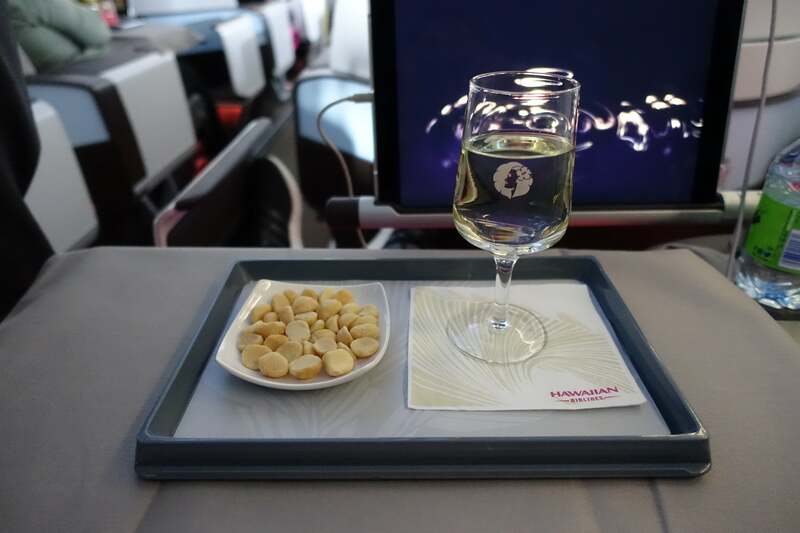 If you want to use points to book this flight, Hawaiian charges a minimum of 40,000 HawaiianMiles for a one-way saver award in First Class, though availability for saver awards is extremely rare. American Express Membership Rewards and Starwood Preferred Guest are both transfer partners with Hawaiian if you don’t already collect HawaiianMiles. Since I don’t have a practical use for HawaiianMiles, I decided to credit this flight to JetBlue’s TrueBlue program. My ticket was booked in the ‘A’ fare class, meaning I earned 1 TrueBlue point for every 2 miles flown — a total of about 2,500 points. 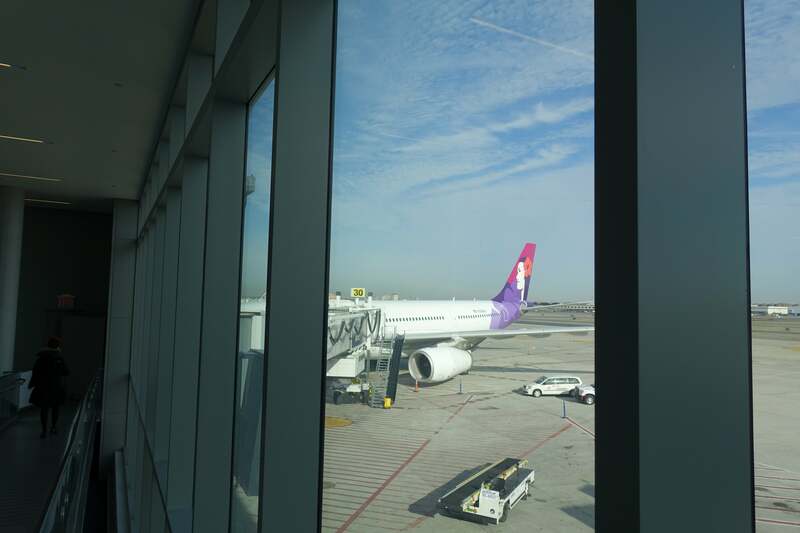 Hawaiian Airlines operates out of JFK’s Terminal 5, which is also home to JetBlue, Aer Lingus and TAP Portugal. The departures hall at T5 is overwhelmingly JetBlue-focused, and Hawaiian Airlines occupies only a few desks at the far end. Considering the ridiculous security lapse that happened at JFK over the weekend, I was very curious to see how the TSA was handling things. Agents definitely seemed to be making an extra effort to contain passengers in line and keep a a closer eye on those passing through the terminal — they were not at all amused when I pulled out my camera and tried to snap a few pictures. 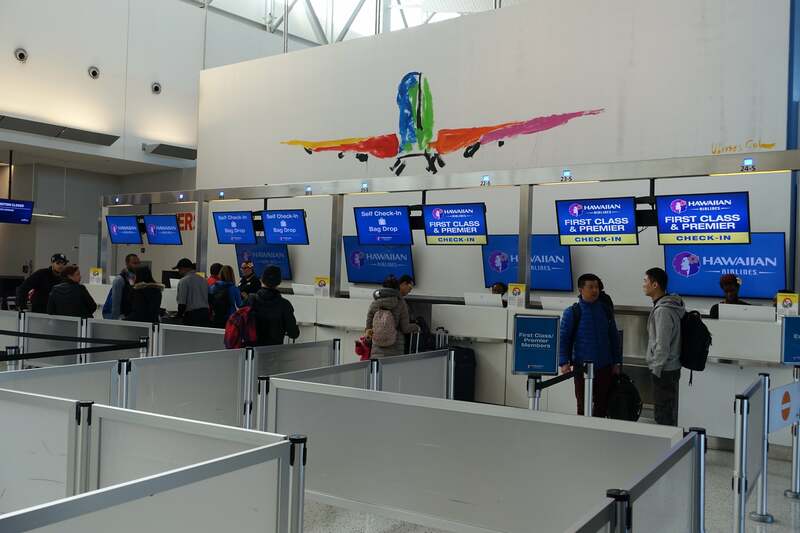 Since I’d arrived after the early morning rush, I was through security within 15 minutes and on my way to the gate, which was located far away from the security checkpoint at the opposite end of the terminal. There were a few food options throughout the concourse, but I knew that I had a large meal waiting for me on board, so I headed straight to the gate. I was already running late due to traffic on the way to JFK, but if I’d had more time before my flight, I would have stopped by the Airspace Lounge, which Amex Platinum cardholders have complimentary access to. 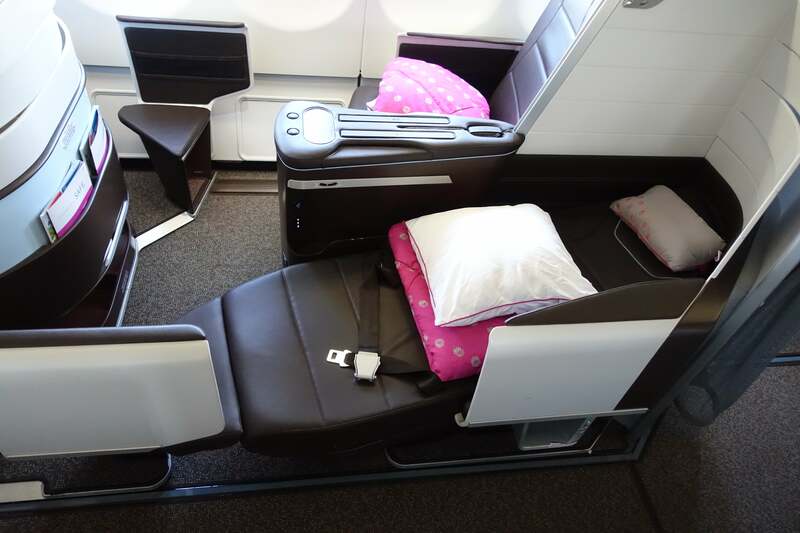 Hawaiian’s retrofitted A330s now sport a first-class cabin with 18 lie-flat seats arranged in a 2-2-2 configuration. Each seat has 76 inches of pitch and is 21 inches wide. 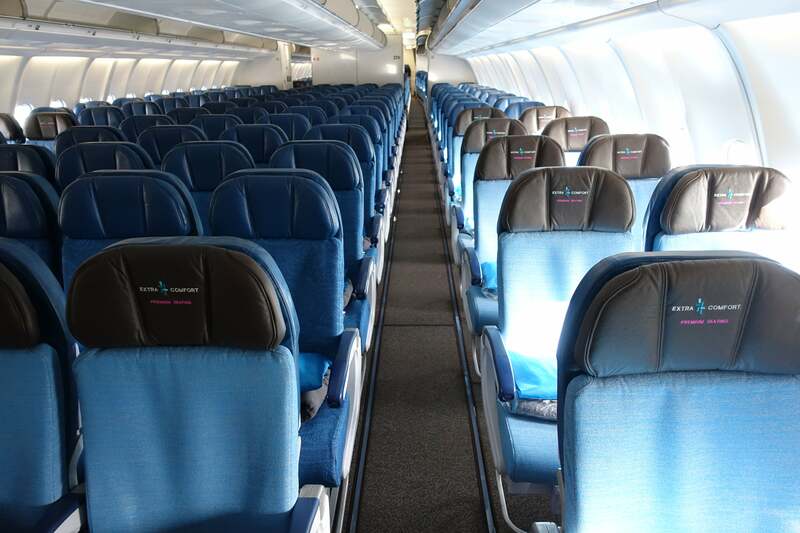 Hawaiian Airlines added more Extra Comfort seats to the main cabin in the retrofit, so these planes now feature 68 of them, up from the original 40 on the carrier’s non-retrofitted A330s. Each Extra Comfort seat is 18 inches wide and features 36 inches of pitch. There are also 192 seats in regular economy arranged in a 2-4-2 layout, and each of them is 18 inches wide with 31 inches of pitch. 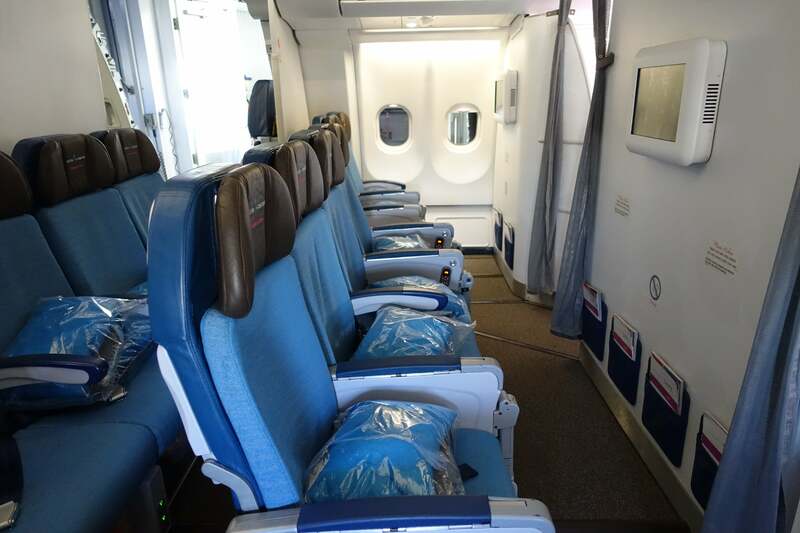 There are several rows of Extra Comfort seats on either side of the aircraft — not in the middle, as you can see in the photo below, since the airline found passengers were more open to paying for extra legroom seats if they had access to a window or aisle. That makes perfect sense to me. 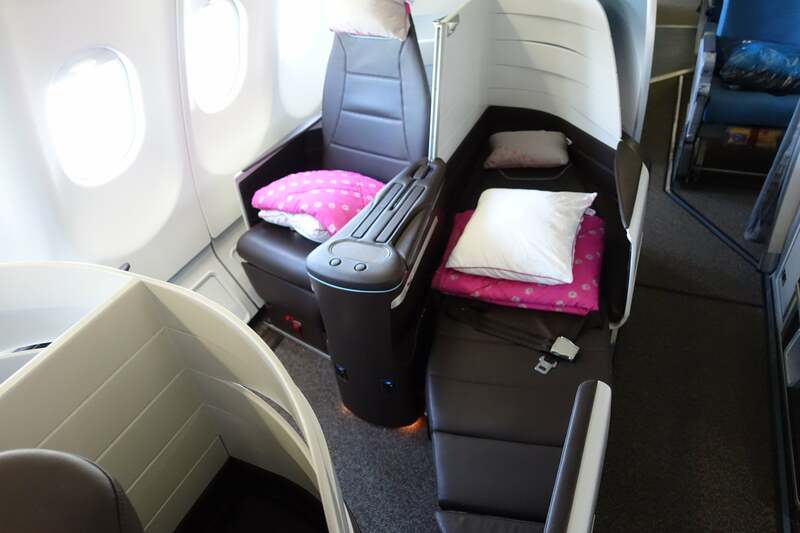 Another interesting feature of this specific aircraft is the two rows of Extra Comfort seats located directly behind First Class. This mini-cabin is very private, especially if you’re seated on either side of the plane. 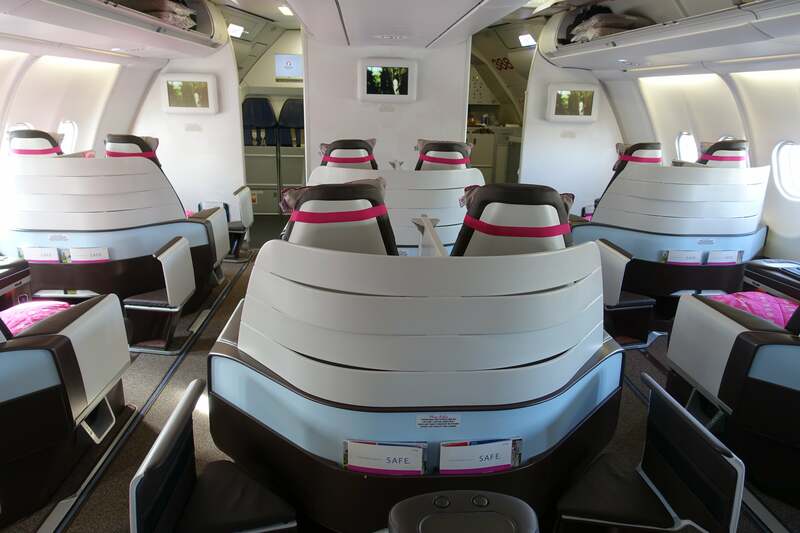 Up front, the first-class cabin is bright and airy, with each ‘pod’ of two seats giving off tropical vibes. 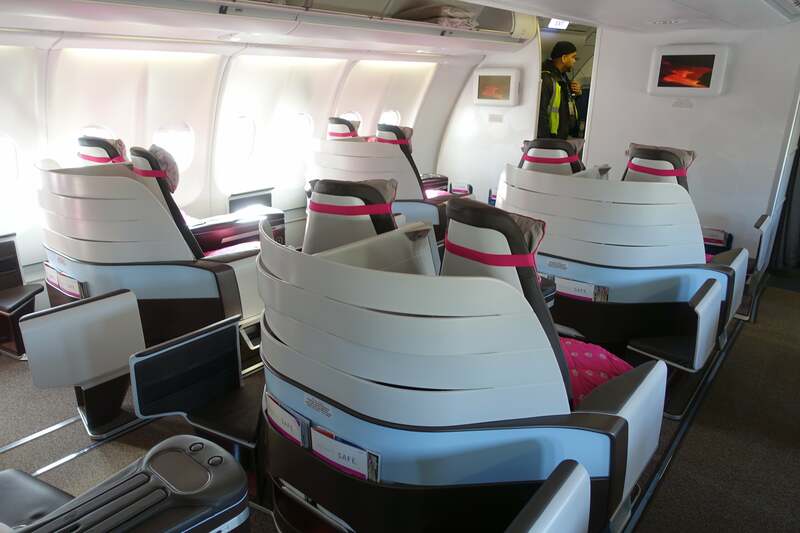 As a whole, the cabin looks totally fresh, its color scheme a constant reminder that you’re going on vacation. 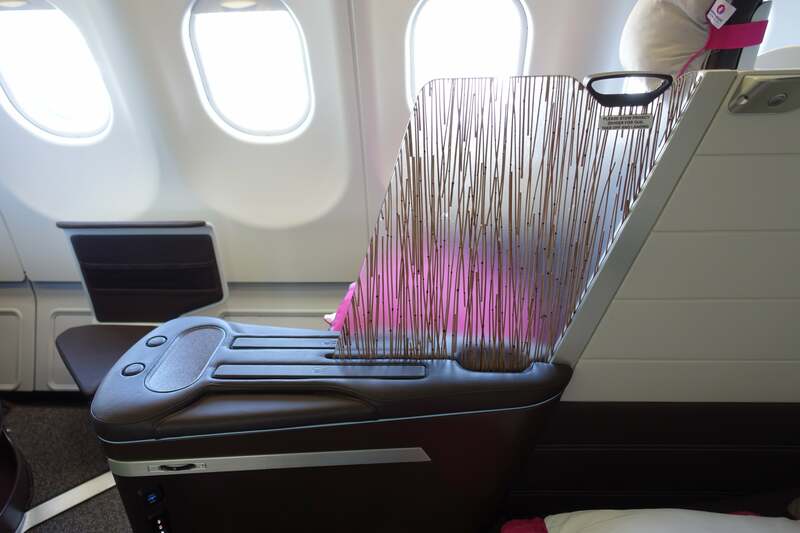 It’s a unique design that makes the space more fun than the typically buttoned-down business-class cabin you’d find on most other carriers. My seat, 3H, was located in the last row of the first-class cabin, adjacent to the aisle, which was great for this long flight. 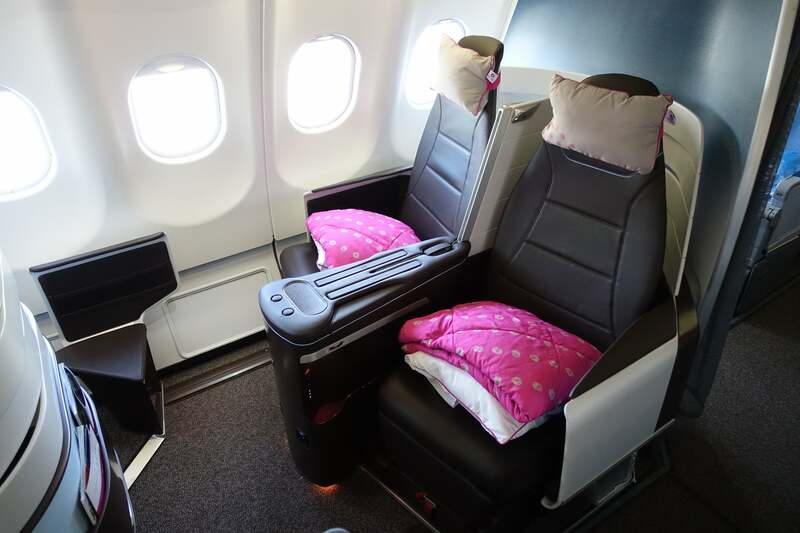 At each seat, decked out in very attractive dark leather, was a small pillow attached to the headrest, as well as a large pillow and pink blanket that added to the fun, vacation vibe of the cabin. Each seat had a fixed ottoman that acted as a foot rest while it was in the upright position — it then became part of the bed when the seat was in lie-flat mode. 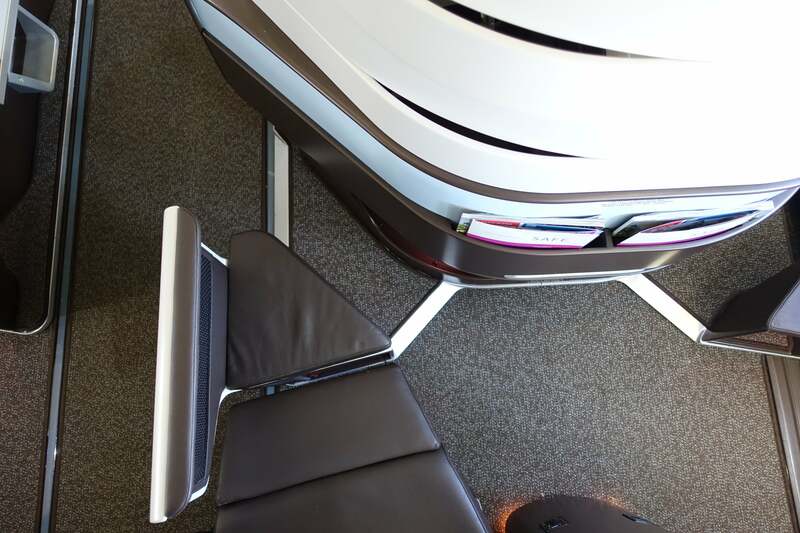 As you can see below, there’s a small space between the ottoman and the pod of seats in front of it, which is supposed to be a pass-through so the person sitting at the window seat can sneak by without disturbing your sleep. I was skeptical of this at first, but actually found it to work well in practice — the extra bit of space also allowed flight attendants to serve the window passenger without having to lean over me. While the seats are operated by a simple toggle switch and recline into a fully-flat bed, they aren’t the widest. If you like to spread out, you might find yourself a bit squished, but I thought the bed was perfectly comfortable and was able to take an excellent nap after a few hours of watching movies and getting some work done. 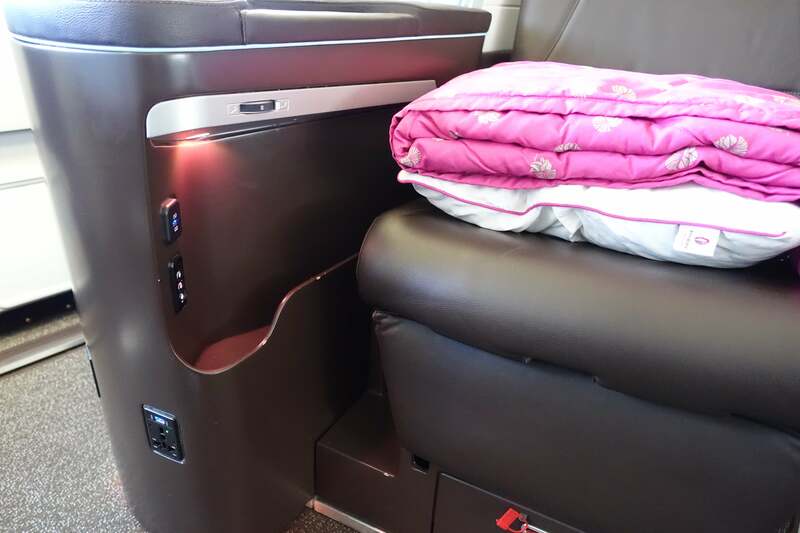 Another great feature of these seats was the availability of power ports — you can plug into one of the two USB ports or the full AC power port. Having the ability to charge more than one device, especially on such a long flight, was a huge perk and something more airlines should emulate. Since I was traveling alone, the privacy divider was important and I think Hawaiian Airlines did it right with these new seats, despite having the 2-2-2 arrangement. The divider was substantial enough to make the seat feel private, but also looked great and since it was light-colored frosted plastic, I didn’t have to worry about feeling like I was deliberately blocking out the person next to me — it’s basically the best of both worlds. 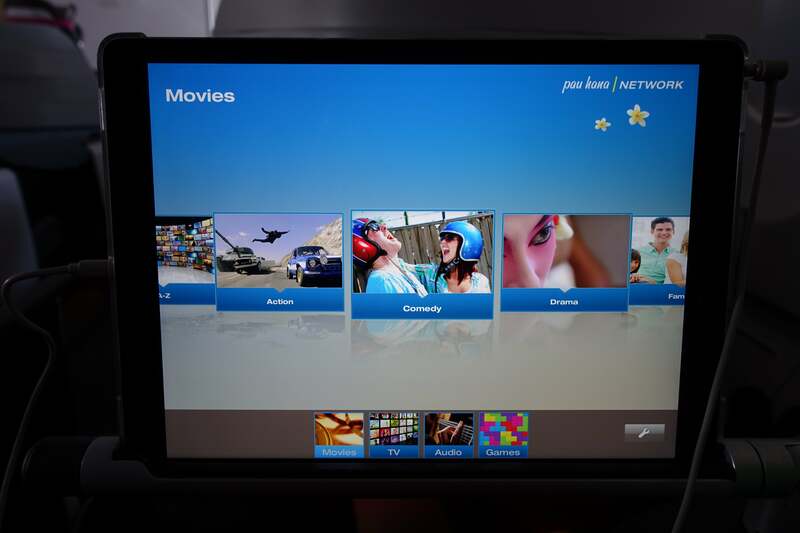 These particular seats don’t feature an in-seat IFE system (more on that later), so in-flight entertainment is provided via iPad Pros that were distributed shortly after takeoff. The airline installed an interesting holder for the iPads, which consisted of a metal arm that pops out of the seat and has an indentation designed for the tablets to fit and stay (mostly) secure. I didn’t have too much trouble with this setup, but if you tend to move around a lot and don’t want to adjust the iPads, you’re going to have a problem. The first-class cabin had one lavatory and featured some additional toiletries, but other than that, it was a standard, small airplane restroom. 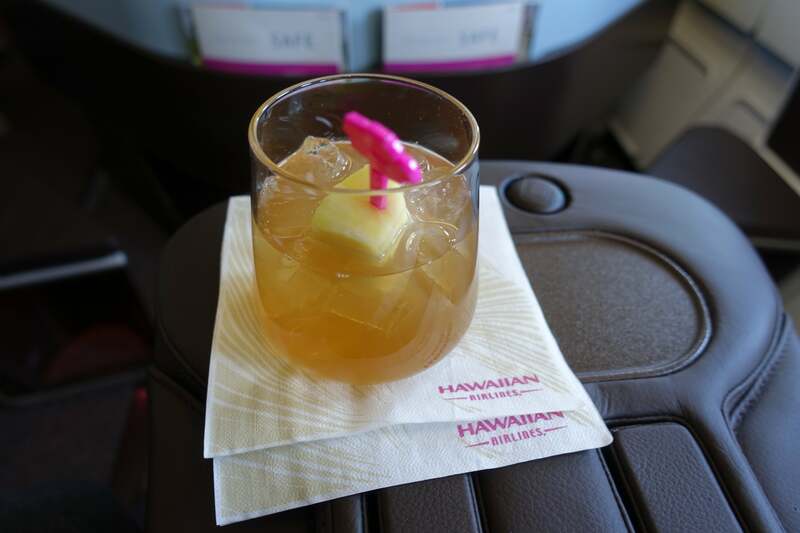 A few minutes after boarding, the extremely friendly flight attendants offered me a pre-departure beverage — a choice of pineapple juice, Prosecco or a Mai Tai. The passenger next to me had a very healthy-looking açai bowl that made me hesitate when ordering a cocktail at 9:30am, but I just couldn’t pass up the chance to get into the Island spirit with a Mai Tai. I don’t regret my decision one bit either. Shortly after takeoff, the flight attendants distributed small water bottles as well as the menus for our flight. They came around again a few minutes later to distribute the iPads, allowing me to get set up with my entertainment before having lunch. After handing out hot towels, the FAs asked for my choice of beverage — there were several beers, wines and cocktails, including the excellent Mai Tai that I had before. I settled on a Sauvignon Blanc from New Zealand, which appeared moments later with a dish of salted macadamia nuts. Both were delicious. Next, I got to choose between two appetizer salads and two main course dishes. For the appetizer, there was either a crab meat salad or a burrata and tomato salad. Being a total cheese head, I went for the Caprese salad and it didn’t disappoint. 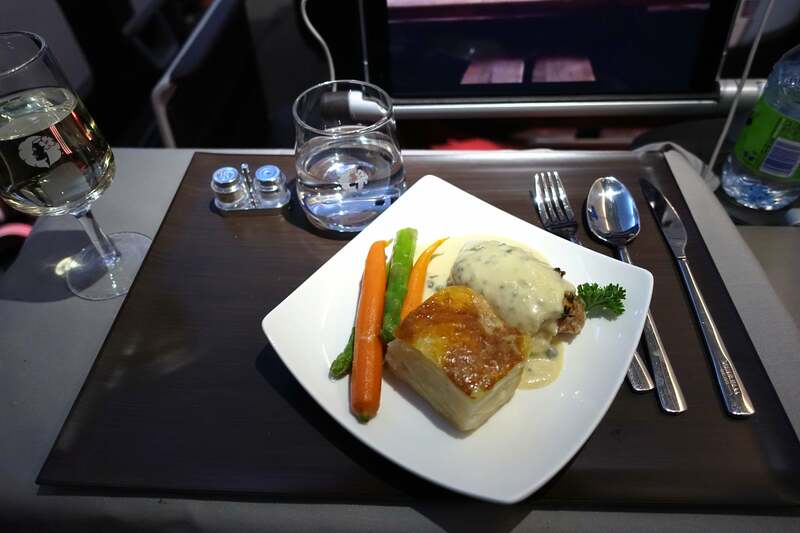 Another thing that impressed me was that the butter was served at room temperature instead of as the freezing cold brick you’d end up with on other airlines. For the main course, there was a choice of a tofu noodle bowl with vegetables or chicken with caper sauce and roasted vegetables. I chose the chicken and once again, it was delicious. Pineapple upside down cake was served for dessert. I was so impressed by the first two courses that dessert ended up being my least favorite course — then again, I’m really not a dessert person anyway so I may be biased. Either way, I had no trouble eating the entire piece. 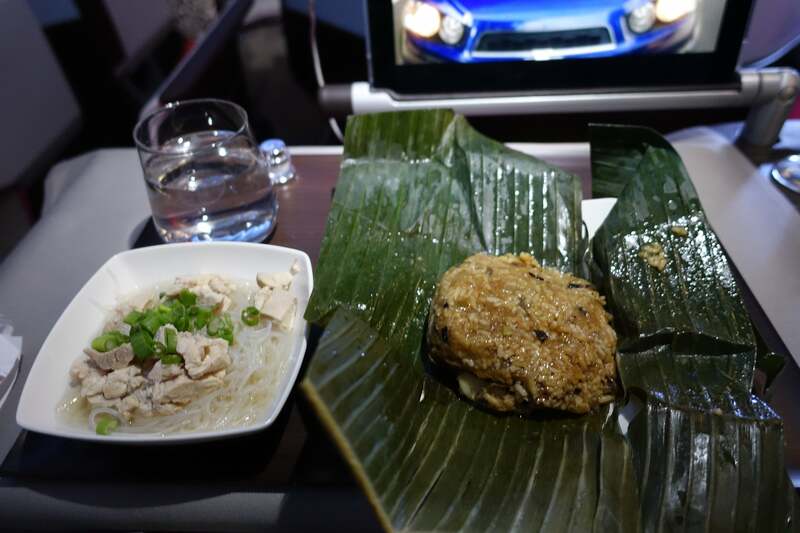 Shortly before landing, I was served chicken with sticky rice and chicken with rice noodles, scallions and broth. The sticky rice was phenomenal, but the soup was a bit bland. When I boarded the plane, I wasn’t offered an amenity kit and didn’t notice any in the overhead bins either. 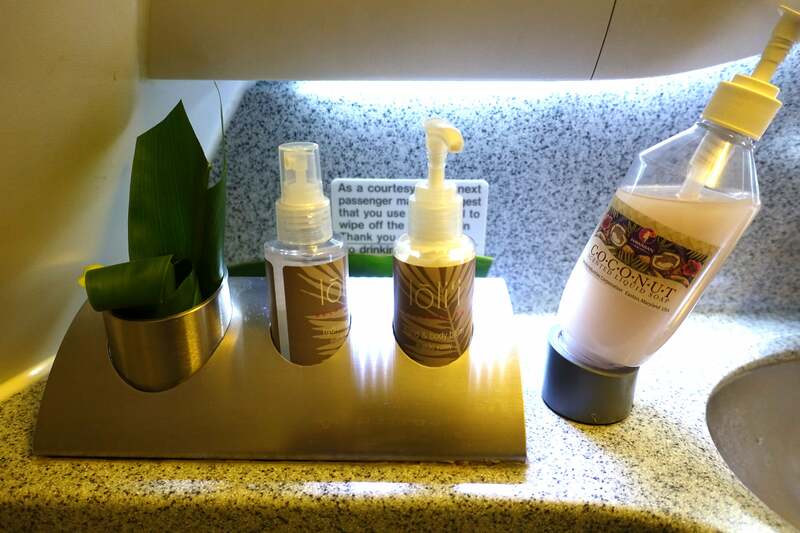 According to a press release from Hawaiian Airlines I’d received, passengers were supposed to receive newly-upgraded amenity kits on this JFK-HNL flight. I’ve since reached out to the carrier for clarification. Another important thing to note is that this aircraft is not equipped with Wi-Fi (at this point). To some, that’s a huge drawback, but for those looking to totally unplug and relax, this could a great thing. But if you want to stay connected at all during the 11-hour flight, don’t plan on it if you’re on this plane. 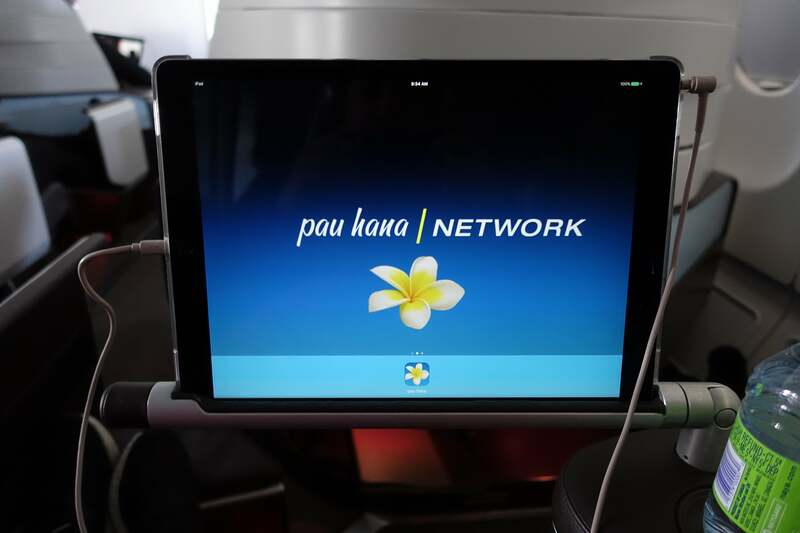 As I mentioned above, Hawaiian Airlines supplies entertainment to the first-class cabin via iPad Pros that are pre-loaded with content — if you’re seated in coach, though, you’ll still have a seat-back IFE monitor in front of you. 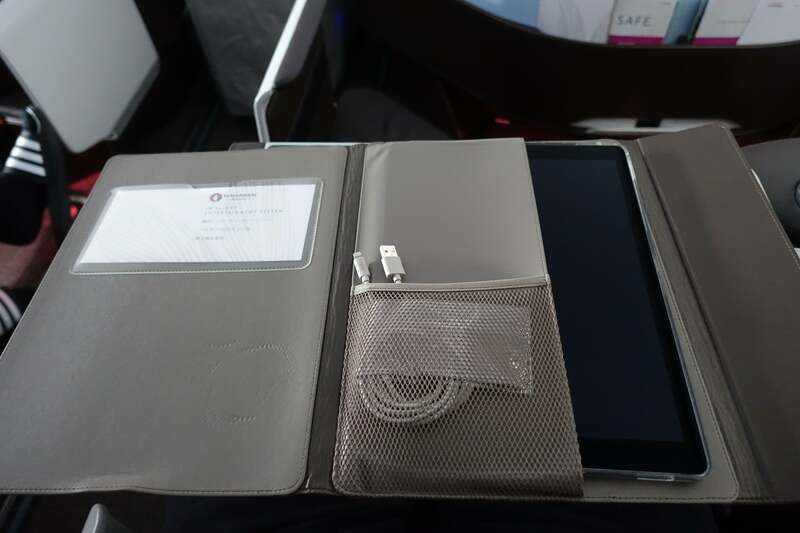 The iPads in first class come in a smart-looking leather case, which you can see in the photo below. Inside the case, there’s also a power cable so you can plug into the USB port that’s part of the seat, as well as a microfiber cloth for cleaning the screen. The airline offered over-the-ear headphones but I brought my own to use instead. 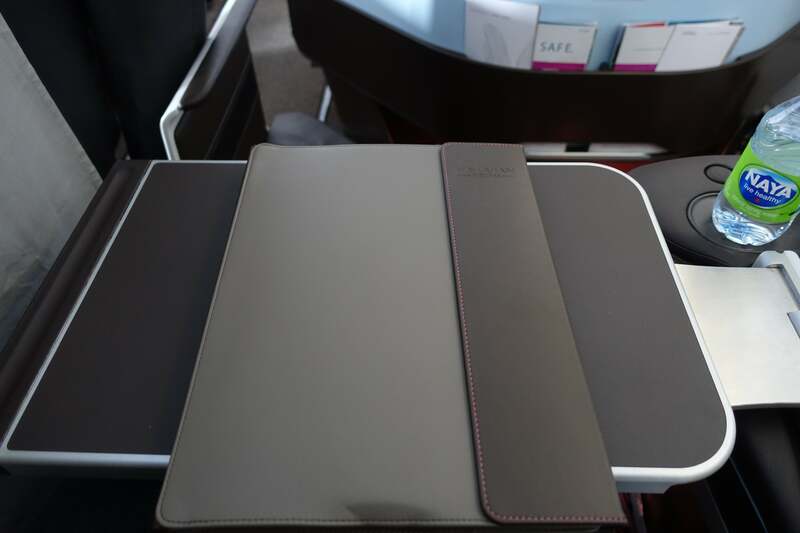 If you don’t want to hold the iPad in your lap or on the tray table, a metal arm folds out from the seat and is designed to hold the tablet in place. I already mentioned this, but the design makes it difficult to move from your seat while keeping the iPad in place, which could get annoying if you — or worse, your neighbor — moves around a lot during the flight. As for the entertainment itself, the selection was decent. I had no trouble picking out two movies to watch, but if you’re planning on staying awake the entire time, you might tire of these options. In addition to movies, there are a number of TV shows, music and games to keep you busy. The interface was simple, intuitive and featured sharp graphics thanks to the iPad Pro. 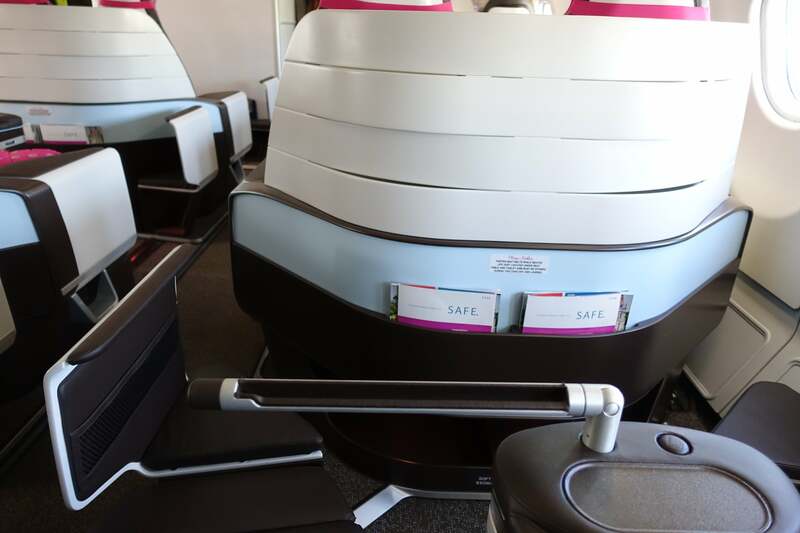 However, some features that you’re likely used to seeing from other business-class products, such as the Airshow or point-of-view cameras, are lacking (though technically, the airshow is shown on screens mounted to the front wall of the cabin). 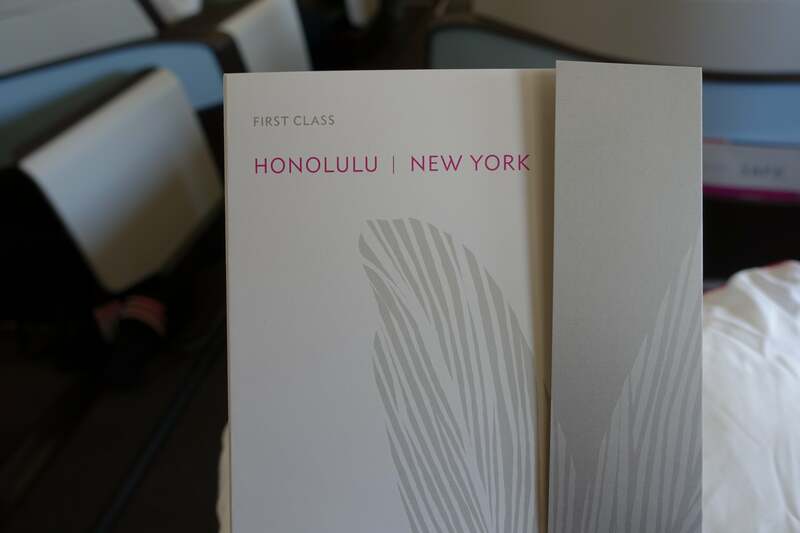 Hawaiian Airlines’ new first-class product is a supremely comfortable way to travel between New York and Hawaii. 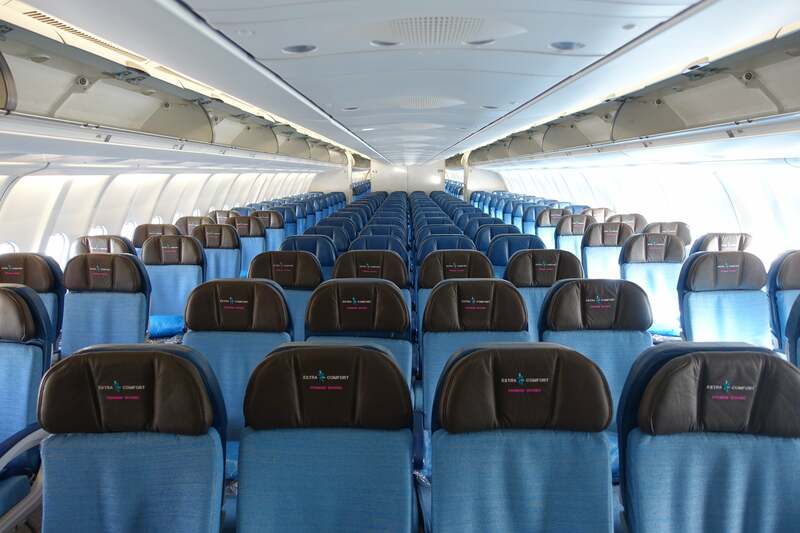 The seats are brand new and comfortable, the cabin is fresh and fun and the food is excellent. Combine all of that with extremely attentive and friendly crew members and it becomes an experience that’s unique and hard to beat these days. 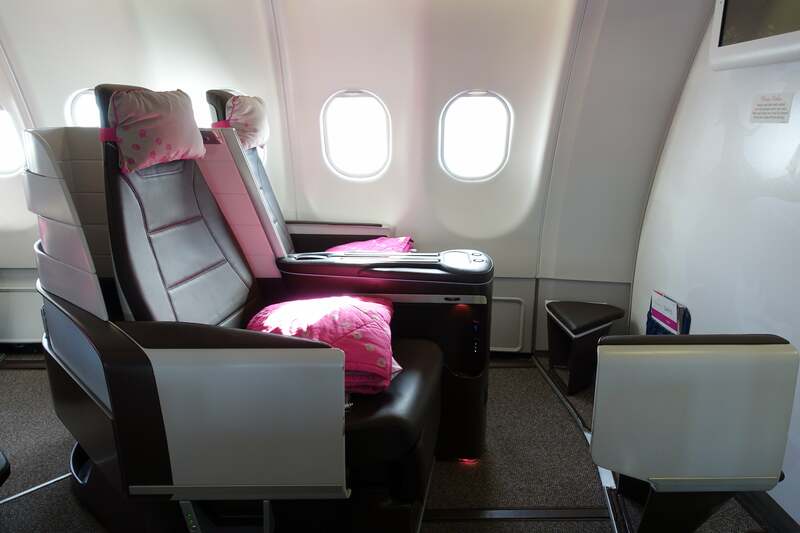 Does anyone have a flight booked in Hawaiian Airlines’ new first-class cabin? What are you looking forward to the most?